Jolla, the Finnish startup comprised of ex-Nokians that’s building its own MeeGo-based smartphone platform and phone hardware has closed out a pre-sales campaign for the device it showed off in May. Thing is, it’s not saying how many phones are in this first pre-order batch — so it’s not really saying very much about the level of demand it’s seeing (or not seeing). Update: Jolla has just sent TechCrunch a second response regarding the batch size — which suggests it may be in the tens of thousands of units range. “Although Jolla is not giving out the exact number of devices prebooked it can be said that the size of the production batch for a mobile device vendor of this size is typically 50,000 units,” a Jolla spokesperson said. Original story follows below. Jolla’s pre-sales campaign took partial payments from buyers wanting to reserve a handset ahead of release later this year (the first device shipments are due at the start of Q4 2013). The pre-sales campaign kicked off in mid-May and was apparently closed out by mid-July, it said today — with demand coming from a mix of “consumers and selected sales channels”. The only figure Jolla is releasing is that online pre-orders were received from 136 countries in all. So that’s a minimum of 136 phones ordered then. Why isn’t it quantifying pre-sales figures? 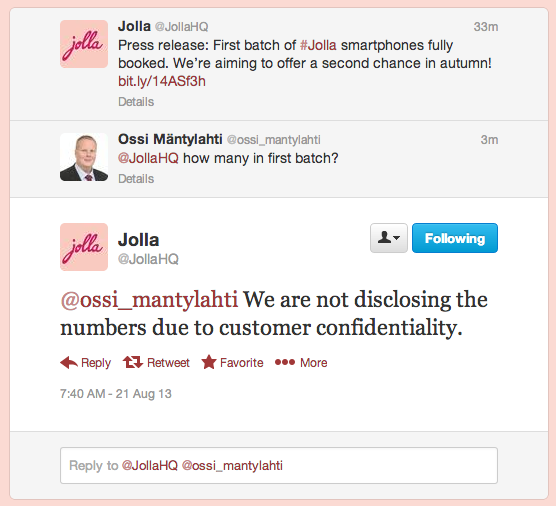 ‘Customer confidentiality’ is the official line according to Jolla’s Twitter feed (below) — but that really doesn’t make much sense. So it’s hard not to shake the view that it doesn’t want to confirm sales figures because they are relatively low. Competition in the modern smartphone space is fierce — so much so long time smartphone veterans, such as BlackBerry, are finding it difficult to ship devices. Having to compete with only startup resources is a huge ask (Jolla’s Sailfish OS has attracted a commitment from an alliance of investors to contribute $259 million to help it build out the ecosystem — however that financing was not committed as an upfront payment so it’s unclear how much has been contributed to date). Still, according to analyst Juniper Research, there is an opportunity for Jolla’s Sailfish to carve out a niche for itself as one of a number of “new emerging players” in the smartphone OS space. In a report this week the analyst said that while Android and iOS will continue to dominate the global landscape over the next five years, the “smartphone OS market will see new emerging players, such as Asha, Sailfish and emerging HTML 5 based OS players begin to gain ground in niche areas”. Collectively it’s predicting these new players could capture 13% of the market by 2018. People pre-ordering Jolla’s first handset in the pre-sales campaign were putting down a partial payment of up to €100 per device. The handset will retail for €399 ($513) in total, with shipments due to go first to European pre-orderers — and to Finnish carrier DNA, the first carrier to sign a deal to range the handset, back in November. Specs wise, the phone has a 4.5″ display, paired with a dual-core chip. It includes 4G, 16GB internal memory plus a microSD card slot, an 8MP auto focus camera, and a user-replaceable battery. Interchangeable shells are a flagship feature, which allow the user to personalise the look and feel of the device — and which link the hardware to the software by some kind of bridging technology, likely NFC. The phone runs Jolla’s MeeGo-based Sailfish OS but will be able to run Android apps, as well as any native Sailfish apps created for it.